Tax time, budget cuts, and the coming of spring have people scrambling for paperwork, cheering or jeering at their TV sets, and swapping out snow shoes for flip flops. 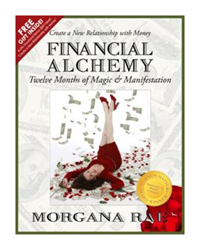 Morgana Rae -- international Amazon #1 best-selling author of Financial Alchemy: Create a New Relationship with Money -- offers tips on resolving those lingering money issues once and for all. International #1 Best Seller "Financial Alchemy"
You're going to have a relationship with money until the day you die, so you better make it a good one! Our relationship with money is as real and dynamic as a relationship with a human being," said Rae, owner of Charmed Life Coaching in Los Angeles. Rae is known by millions of television viewers as the world’s leading Relationship with Money Coach. She believes that our individual connections with money must improve for true and lasting economic recovery to take root to grow. Hidden beliefs cause us to unconsciously repel and protect ourselves from money, and that needs to change. "When you can imagine your money as a real, flesh and blood person, worthy of your deepest admiration, you embark on an amazing, love-at-first-sight affair of the heart,” Rae says. “And, it’s like any other relationship. It comes where it's invited and appreciated. It rarely comes when it's chased,” she adds. Rae offers these tips to guide people to turn over a new leaf with their money relationship now. Deal with the money monster that is already there. People think they want money. Money is the #1 excuse for everything we can't do, have, or be. It's the dream killer. Issues around healthcare, social security, and infrastructure have us running scared. My advice? Get honest with your current relationship with money. You can't have more of something that you fear or despise. Separate negative feelings from positive desires. Transform your “Money Monster” into your “Money Honey.” Talk to money as if it were a person you love, trust, and admire instead of someone you hate, distrust, or fear. Imagine asking money for advice. Don't let people owe you money. Don't under charge. Don't ignore your money. Don't hang out with complainers, crooks, gamblers, and people who are irresponsible with money… or make you feel bad for making money. Turn over a new leaf on money. Cultivate feelings of partnership and appreciation. Charge what you deserve, and work with people who value you. Pay your debts and act with honor. When you do, you feel better, and you show up well as you move through life. Treat money with trust, admiration and respect, and find new respect for yourself as you do. It’s amazing what you can accomplish when you find courage, and resourcefulness to conquer your money challenges and the generosity to give to others. Known by millions of television viewers and radio listeners as the world’s leading Relationship with Money Coach, Morgana Rae is the international #1 Amazon best-selling author of Financial Alchemy: Twelve Months of Magic and Manifestation. Morgana's groundbreaking program for creating and retaining wealth has earned media attention from ABC, NBC, FOX, PBS, NPR, CNN, United Press International, Yahoo Finance and The Wall Street Journal. She has coached over a thousand clients on 6 continents, including a hedge fund director, two advertising agency owners, a real estate billionaire, and many hundreds of spiritual entrepreneurs. She's taught classes and given keynotes from New York City to Norway, Baja California to Bali. Morgana Rae welcomes media interviews, quantity purchases of her books, and invitations to speak. Reach her at wecare(at)morganarae(dot)com or 310-657-5340. She offers free access to a Relationship with Money Quiz to test your relationship with money.